Here are a few different categories that might help you to settle on what culinary herbs are most useful to plant. I’m not an avid backyard gardener. My thumb is less than green, and my small patio is shaded by trees and fences, preventing prolific vegetable growth. But I haven’t felt the loss too keenly, as I have a farmers market across the street every week. Potted herbs, however, are my exception. I manage to not kill them (usually, anyway), and it’s hard to argue with the convenience and freshness of stepping outside and snipping whatever I need. I recently wandered the aisles of my local nursery trying to decide what to plant. Unfortunately, my eyes are bigger than my pots and, really, my appetite. Here are a few different categories that might help you to settle on what culinary herbs are most useful to plant. Be sure you also think about what makes sense for the types of dishes you think you’ll be making — this list is by no means comprehensive. How many recipes call for just a sprig or a few tablespoons of an herb, and yet you are still stuck with a clamshell package or a bunch of extras? There are at least a couple of herbs I think are guilty of this, but they’re versatile enough to keep in your back yard. At the top of the list are thyme, rosemary, oregano, sage and chives. And they have a built-in bonus: They all come back each year. Bonus bonus: Chive blossoms are very pretty. Basil (sweet or Genovese) is my favorite herb that falls into this category. I usually have at least three or four plants in my yard since pesto is such a staple of my summer diet. The more you pick, the more it grows. Parsley, dill and mint are other prolific options that also can be used in large quantities. I’d throw cilantro in, but I have yet to successfully keep a cilantro plant alive through the summer. If you can, more power to you! I love making Thai stir-fries and noodle dishes, and Thai basil is one of those ingredients that really helps you come close to replicating the flavors of restaurant dishes. Thai basil can be tricky to find unless you go to an Asian market, and even then it can be hit or miss. But your local nursery probably has it in stock, which makes getting your own plant an ideal solution in my book. Like the Italian varieties, it’s simple to grow and harvest. Fresh culinary lavender is something else to consider, especially if you like floral flavors. It’s nice in dressings and baked goods. Buy a variety that specifies it is suitable for eating. And while peppermint and spearmint fall into the category above, you could devote a pot to different varieties such as chocolate mint or pineapple mint. — Herbs like full sun, free-draining soil and an open and airy location, as opposed to shade, heavy clay soil and thick wood mulches. If you’re planting in an herb bed, incorporate gravel and sand into the soil and then mulch with a layer of gravel. Water occasionally but deeply. — Containers make it easy to manage soil and sun. 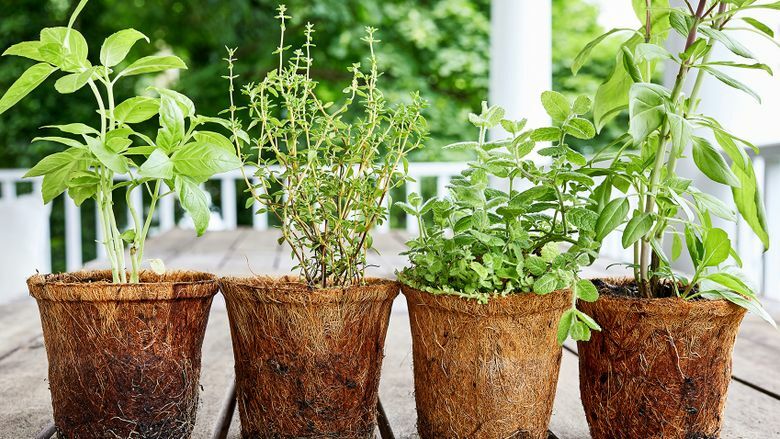 Larger containers are better for the plants, but because they can get heavy, make sure the pot is where you want it before you start filling it and transplanting the herbs. — Water containers more often but allow them to drain well, so no saucers underneath. — Leafy herbs like to be used — cutting stems will promote bushiness.